Facebook was founded in 2004 by Mark Zuckerberg, with some other students of Harvard University. The purpose of Facebook back in those days was a social network that allows members of Harvard University to create social relations through the site. Gradually the website, allow users from other universities and finally it was opened to anyone who was older than 13 years old. However, nowadays Facebook is more than just a social network website that allows people to crate social relations. Facebook now, represent a tool for companies that allows them to create a profile, which can be used to promote its products or its services, or on the other hand it can be used as powerful tool to offer customer service to the customer, in which they can add reviews or comments about the services or products that they just purchased or have the intention to it. Facebook represents a powerful tool to offer customer service especially for companies who sell services instead of products; this is the case of banks or airlines, among others. Since it is not common that they sell their services through a third party website, which is the case of products, and probably the best example of it is Amazon, where customer can add a review of the products purchased; and on the other hand they do not provide spaces for customer review in their own website either. The reason of this might be that Facebook can reach a larger amount of people than their own website. This customer service tool can create value to the company or can even damage the image of the company if it is not use it correctly; this is to say if there is not a close follow up to the complaints or comments of the customers. Companies have to be aware of the power of this tool and use it in their favor. However companies have to be efficient and filter carefully the posts because some people do not use this tool wisely and just use to harm the image of a company. Facebook represents a powerful tool not just for companies but also for customer, who sometimes do not find other simple and efficient spaces to share their doubts or complaints, this is to say it is easier to write a post in a Facebook page than calling a customer service that probably will take you 10 minutes or even more on the phone, not taking into account that sometimes you have to pay in order to be able to call. Therefore customer should be aware that the utility and power of this tool, and use it wisely. An example of the power of this customer service tool can be seen in Figure 1 and 2, which have totally different purposes, but both certainly can create value to the company if the customers at least receive an answer with orientation about their concerns. Figure 1. Example of a concern in the American Airlines Facebook Page (Retrieved from: https://www.facebook.com/American Airlines, 11th of May 2014). Figure 2. 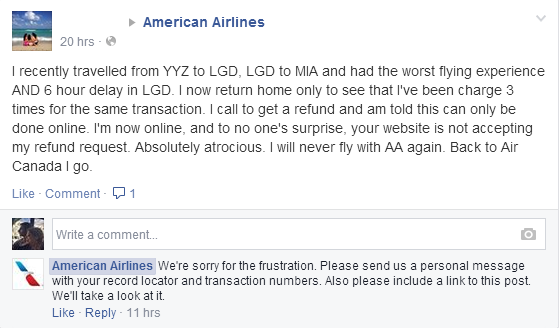 Example of a complaint in the American Airlines Facebook Page (Retrieved from: https://www.facebook.com/American Airlines, 11th of May 2014). Previous PostLibreOffice: The Document FoundationNext PostLook! Up in the sky! It’s a Dwarf! It’s a Druid! It’s Nerd Fitness!